I have a complicated relationship with "light historical romance." I want to like them but finding one that doesn't make my brain bleed is getting to be an increasingly tall order. The problem, as I see it, is sometimes authors confuse "light in tone" with "light in substance." Yes, I will happily gorge at the Cotton Candy Trough, but you've got to toss in a bran flake or almond every now and then to give me something to actually chew on. By now I think it's pretty well known that Eva Leigh is a new pseudonym for Zoe Archer. When I first heard this news I thought, "But why?! Zoe Archer writes historicals, Eva Leigh writes historicals, what gives?" Now that I've read Forever Your Earl the first book in Leigh's Wicked Quills of London series it makes more sense. 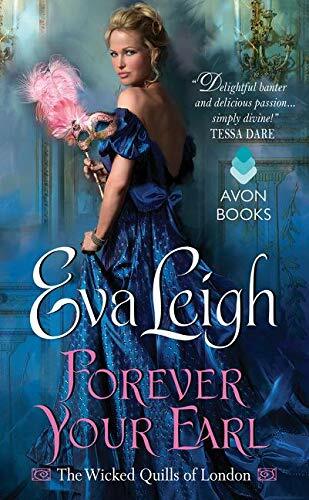 Archer historicals tend to be a bit action and adventure while Forever Your Earl is straight-up frothy Regency historical. The thing that keeps it buoyant is Leigh's sparkling knack for dialogue and a feminist core that somehow doesn't feel totally overblown modern. Eleanor Hawke owns and edits a scandal rag, The Hawk's Eye. She's worked her way up from nothing, brought her paper into profitably, and her readers love every juicy morsel she tosses their way - especially when she's writing about Daniel Balfour, Earl of Ashford. Lord A-d is a rake of the highest order, so he rarely disappoints when it comes to providing publishable material. Well, that is until he shows up at her office demanding to see "Mr. E. Hawke." Imagine his surprise when he finds out the editor of the scandal rag that's obsessed with his every move is a woman. Daniel would normally not give a flying fig, but Eleanor's keen eye dogging his every move could blow apart a bigger scandal he has no intention of making known. A good friend, a Duke's younger son, has gone missing. The Duke's heir dying unexpectedly leaves Jonathan next in line, but ever since he returned from the war he hasn't been quite right. Daniel will do anything to find and help his friend, but having Miss Hawke sniffing around is too dangerous by half. So he figures, why not keep your enemy close? He promises to take her out on the town, show her what a rake's life is really like, and she gets plenty of material that will keep her diverted from Daniel's true mission. It all seems perfect, until of course he finds himself falling in love with her. What Leigh has done is give readers a heroine who is "ahead of her time" but somehow keeps this story from completely jumping overboard into the absurd. There are some readers who will say that all "ahead of their time" heroines are anachronistic - a theory I've never subscribed to. I mean, if there never were, truly, any "ahead of their time" heroines in the world - well, the lives of women would have remained totally unchanged since the dawn of time. I think where Leigh succeeds is by not completely throwing the baby out with the bath water. Eleanor is unconventional, but she still has to play by some rules. Every time she's around "polite society" in this story it's hanging out with rakes after hours, in disguise, and digging up dirt. We don't see her in glittering ballrooms having conversations with people who, in actuality, would treat her like something unpleasant they need to scrap off their shoe. What's remarkable about this book is that it almost reads like a love letter to romance readers and writers. Why was she so bloody angry? It wasn't as though Ashford hadn't expressed opinions she had never heard before. People called her work, and The Hawk's Eye, trash. Or they damned it, and her, with faint praise. You're too talented to waste yourself on ephemera. Why don't you try writing something real? Something with actual substance? And that's the tip of the iceberg. Eleanor's first night out with Daniel involves her having to disguise herself as a young man. As Daniel teaches her how to "act the part," she, in turn, basically tells him the unvarnished truth about how unpleasant it can be to be a woman in a man's world - right down to the Regency equivalent of "man spreading." Still, sometimes the parts don't always add up to a whole. I found this book a slog to get through at times and it took a while to put my finger on why - it's the pacing. Here's a perfect example - it takes us 100 pages for Daniel to show up at Eleanor's office, proposition her, for her to go to her friend's theater for a disguise (Sequel Bait!) and for them to get through their first night out together. 100 long pages. Do I read too much category romance? Is it the seemingly constant lack of focus miring me in my current reading slump? Is it because this story is "light" and there's not a bucket-full of Angst-O-Rama-Jama? Perhaps. Pacing is in the eye of the beholder. But I could have done with 50-75 fewer pages. Which leaves me with This Was Good. I didn't love it to bits like some of Leigh/Archer's other work (check out her Blades of the Rose quartet or Lady X's Cowboy), but this is the strongest "light historical" I've read in a dog's age. Plenty of banter, interesting characters who rub each other in just the right way, and a feminist core that never devolved the story into absurdity...the book's title notwithstanding. Okay, now I know I need to get this one, the next time is on sale. I read this one and purchased the second at the same time but my reaction was the same -- kinda "meh." I haven't read the second one yet and it doesn't call that loudly to me. :) I loved Archer's Blades quartet and the two 8th Wing books. Wish she would do more of those.